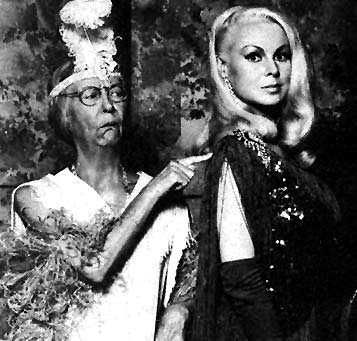 Of the 7 Flatt & Scruggs episodes from The Beverly Hillbillies TV series, Joi Lansing appeared in 5 of them. She was Gladys, the bosomy blonde wife of Lester Flatt! Lester, as you may know, was one half of the extremely successful musical duo Flatt & Scruggs (he played guitar), but significantly older than his wife. The ongoing gag of their "Beverly Hillbillies" appearances was that these two older country boys had absolutely stunning young wives. Joi always filled out her clothes pretty well on the show, especially on top, and although she could act most of the times you'll sit there in front of the screen going "Ga! Ga! Ga!". But seriously, she was funny in a cute sort of way and didn't play an airhead bimbo.